Fewer than half of employees would recommend their employer to a friend according to Glassdoor. Would you? Have you? Allegis found that 69% would not take a job with a company if they had a bad reputation – even if they were unemployed! The employee journey has many parallels with the customer journey and tolerance of a poor experience is lower. Businesses need to know that their reputation is now shared more widely than ever before. Expectations of how a company will drive our own personal agenda are high and, should they fall short, the ability find out about a better alternative and change is much easier now than in the past. So if you’re looking to create an “employer brand”, one where top talent shouts “I want to work for them!”, there is good news and bad news. The good news is that whether it’s intentional or not, if you have employees you already have an employer brand. The bad news is it may not be the one you want. The first step is to know what that is today, be clear about what you want it to be in future and get creative about closing any gaps. This must be done in the context of your company’s purpose. Why do you do what you do? (beyond making money), what do you do that no other brand does? What makes you excited about working there? Thankfully, journey mapping can help define what a ‘great place to work’ looks like. It’s a valuable tool that gives us an understanding of what it’s like to be a customer and it helps organise the thinking and prioritise activity. It shows how well the brand promise is being kept, or not, and it brings people together from different functions to see the impact of their combined efforts. I see many organisations map their customers’ journey successfully and reap the benefits of doing so. Far fewer, however, apply the methodology to their people, resulting in a missed opportunity. The perception of your brand, and of your employee’s engagement with it, will vary depending on what stage they are at. A graduate looking across the sector for reasons to work for you will see things differently to a new hire going through the recruitment process, versus an employee who’s been in their job for 10 years or a high level employee who’s just been promoted into a director’s role. Understanding the importance of employee engagement is one thing but knowing how to go about it is another. This is why journey mapping is effective, it helps to create empathy and understand around how they might be feeling, the challenges they face, or how they will change depending on the employee and how big the gap is. Define the journey Be very clear about the journey they’re on. You may have a particular experience in mind such as the recruitment process, the first 30 days or going through a restructure. To help you find that starting point, you may want to map all of the events across the entire journey from brand awareness, performance reviews and ‘a typical day’ to promotion, exit and retirement. Then you can choose which one(s) you want to drill down into to become a journey in its own right. Who are they? Whose perspective do you want to map the experience from? Employee personas will be much the same as for consumers – who are they, what are their goals for that journey and why, what are their pain points? Map the journey Set out the stages, and for each one look at what they do, think and feel. What do they hope for, wish you would do, or provide? Are they motivated more by flexibility and support than money? How can work fit around their lives better? Capture the internal issues you have as a business that help or get in the way. Metrics What data or information do you have access to that shows how well you’re doing the important things? Validate Sense-check the journey and conclusions with other employees and overlay other relevant feedback you’ve captured elsewhere. Do something Take action. Agree the priority areas that need focus and who’s going to do it then keep people updated on progress. One simple exercise to help prioritise your next steps is to plot out everything your employees have said, identifying the most important against an axis of ‘how well do you do them?’. Assuming you have collected this data, figure 1 below shows an example. 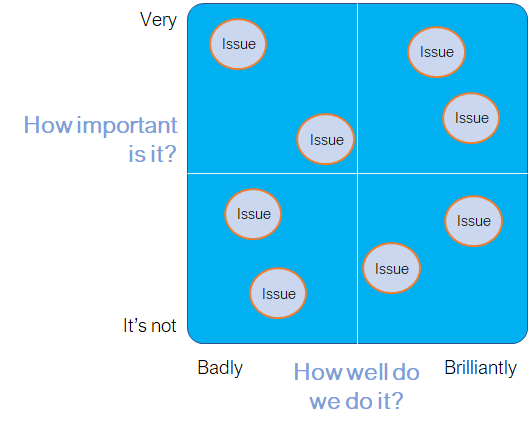 If you have an issue in the top right quadrant, where it’s important to employees and you do it well, make sure you protect it and share the stories. If there’s an issue bottom right, where you do things well but employees don’t much care for it, either explain where the value is and why it must be done that way or consider if you are wasting resources on it. Bottom left, where it’s not important and not done well, ask why you do it at all. The key area is top left – if there are things your people say are significant but you’re not meeting their expectations, that’s a key area to start. Be aware of the possibility of opening a cans of worms, which in a way is what you want but make it clear that none of the comments need be attributable to an individual. Remember that any suspicion that confidentiality is not protected will suffocate the quality of insight. Make the session fun but keep reminding people of the need to stay in character and role-play the personas. Help them to avoid drifting back to their subjective selves. Ensure you invite people from similar levels across the business. It may mean doing several workshops but, depending on the culture, having your boss in the workshop is one thing; having their line-manager too (or beyond) can be intimidating. People either say nothing or say what they think others want to hear. How do potential employees find out what it’s like to work for you? What makes you distinctive as an employer and how are you communicating that message? What are your employees saying in terms of what you’re getting right? What do they find most frustrating? How many of your employees engage with your social media activity, have ‘liked’ your Facebook page or follow your LinkedIn page? What perceptions do your employees have in terms of how their customers think about them? If employees were given a branded t-shirt or jacket to wear in town at the weekend, would they be proud enough to do so? Brands want their employees to be true brand advocates; telecoms giant O2 talks in this video about their challenges and how they rewarded employees for being brand ambassadors. Measuring employee advocacy can actually be straight forward. If one of your employee value propositions is that you are ‘innovative’, ask them exactly that, to what degree do they think you are innovative? Make sure you link your questions directly back to the values. The NPS approach is also commonly used as a form of measurement: “On a scale of 0-10, how likely are you to recommend this company as a place to work?”. Brands can explore what employees are scoring them and dive into the relationship further; those who are promoters perform one set of behaviours, whereas passives and detractors tend to display a different set of actions. Brands need to ensure they’re not just paying lip service, putting up posters around the office that speak to being ‘a ‘great place to work’ is not a solution or way to drive engagement. The impact of what your ‘leaders’ do and say cannot be underestimated, their actions build evidence for employees of what the company culture is really like. 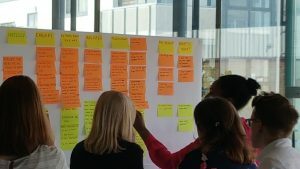 During a journey mapping session I facilitated, a leader of a professional services firm said defiantly that he would not make time to go out and talk to his clients to understand them better unless he could bill the client for that time. 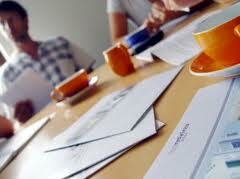 This was also a business with stated values of giving exceptional and distinctive client experiences. You can imagine the deflated feeling in the room this then created. Worse still, the good talent will recognise this and potentially move to a competitor who is delivering the promised experience. Some time ago, I was consulted on the customer experience of a utility company’s contact centre. Their leadership team was satisfied with the apparent high-levels of engagement reported by their internal survey. However, the reality couldn’t have been more different, their people were totally disengaged because they had to compensate for the persistent problems that management wouldn’t address. Employees would type out feedback rather than leave it on a post-it note because they feared their handwriting would be recognised. They would rather tell friends they were unemployed than say who they worked for and they only ticked the “I’m highly engaged” box in the survey because they believed it was a prerequisite to getting a bonus. Complacency can be real damaging force. Business leaders may say: “We’re doing well, we’re making a profit, customers are satisfied and we have talented people who know what they’re doing. Why change anything?”. Journey mapping will however help you surface what to change and why, the activity itself isn’t the end-game but far from it. It’s a means to an end where it gives a business the evidence as to why it should do things differently. These insights will generate engaging stories to showcase your employer brand, take these examples from L’Oreal, Zappos and Cathay Pacific. Other leading brands such as Homeserve actively encourage their employees to leave reviews online, using metrics such as their Glassdoor score as a key performance indicator. 87% of engaged employees will recommend your products and services to someone who might need them, versus 21% of disengaged employees. 82% of engaged employees would do something good for the company even if it was not expected, versus 19% of disengaged employees. 60% of engaged employees will make a recommendation about an improvement, versus 15% of disengaged employees. Journey mapping the employee experience creates clear tangible benefits. A brand that does what it promises, attracts better talent and drives retention, this is something that doesn’t rely on paying top salaries. Employees are then empowered to give the best customer experience possible and proud to tell friends that they work for a great company. For your employees, customers and the bottom line, this truly is the best news you can hear. At the recent CXPA networking event in London hosted by Pen CX, the world of the CX professional was thrown into the spotlight. I wanted to share thoughts from two of the presenters, who reminded us of some of the practical yet vitally important things we need to do to bring about the right change. First, Ali Lawrie, Head of Customer Experience at Akzo Nobel, owners of the Dulux paint brand among others. Ali talked about the challenges of bringing the customer agenda to the fore in a B2B organisation which, understandably, has had a keen focus on technical product development and the sales supply chain. A lesson she’d learned early on was to not underestimate the time it takes to win stakeholders round where they have their own priorities. Perseverance and resilience are essential qualities of the CX practitioner. It’s time well-spent though and an investment that pays dividends. Getting the attention was also helped in no small part by demonstrating the reality of today’s experience using customer verbatims. To see a metric that says customers are waiting three minutes for a call to be answered may not be a catalyst for instant transformation. But hearing the direct impact on the customer, who might be an architect about to see a key client or a hospital property manager reaching out for some quick advice, expressed in their words with the emotion that goes with it, is infinitely more powerful. Furthermore, it can show how a company’s brand and advertising is potentially being wasted because the experience does not deliver the promise of (a variant of) “We put customers first”. It’s a valuable and necessary conversation to have with the Marketing team. Journey mapping provided many of the insights for Ali and those exercises also created six key stages of the experience, each now represented by an icon. Bringing to life the customer experience is at the heart of an effective CX programme and so the more visible it is the better. Sharing the icons and explaining the stages now references any activity to a specific part of the journey, has helped engage and involve colleagues and makes communications clearer. Creating a stronger business by using Customer Experience thinking will not happen without complete engagement right across the business. To engage not just those who are customer-facing but also those who are back-office or in management roles is a big stretch for many fledgling CX teams,. So Ali’s advice is to spread the message and create movement from within through the extended use of CX champions – finding people from all parts of the business who take an interest, want to be part of the movement and see it as a good development opportunity. They will be the eyes and ears of CX inside and across the proverbial silos. 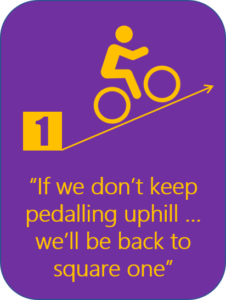 Mike Bellis of Pen CX and formerly of Pfizer, then reflected on how he changed his approach to win people round. 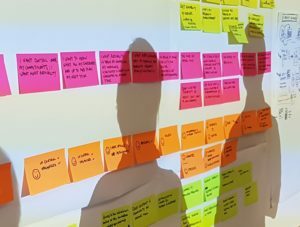 “I started by highlighting issues that were affecting customers and trying to get them fixed, but this was seen as creating new problems within the organisation rather than trying to fix those which were perceived to be there already”. As this approach wasn’t developing very much engagement, Mike quickly changed tack. The new approach was to understand internal stakeholders’ issues first and then show how a focus on Customer Experience could help overcome them. Before long he was everyone’s best friend. The momentum grew as colleagues from around the globe came knocking on his door for his methodologies and thinking. Anyone who works as a CX professional will know how hard these things are to do. It’s therefore reassuring to hear that with persistence they can still make a difference. As Mike Bellis summarised, “In principle, Customer Experience is simple. It doesn’t mean it’s easy though”. Thanks to Ali and Mike, also to Neil Sharp of Pen CX for organising and hosting the event. If you’ve any thoughts on what can be done at a practical level to help a business become more customer-centric, please share them! I’m Jerry Angrave and I help people in Customer Experience roles do what they need to do. I’m a CCXP (Certified Customer Experience Professional) and am one of a handful of people globally who are authorised by the CXPA to train CX professionals for its accreditation. I founded Empathyce after a long career in CX and Marketing roles and am now a consultant and trainer. I give CX professionals the skills, tools and confidence to be the ones to drive their Customer Experience efforts forward. So we now know that United breaks customers as well as guitars. Knowing how your business treats its paying customers is one thing; understanding the impact it has on them is quite another. If the organisation is focused primarily on operational logistics, load factors and revenue per mile then such practices are going to be carried out regardless. But, there’s a real disconnect when, as the airline states, it wants to be a leader in the industry and its goal is “to make every flight a positive experience”. I doubt anyone at United has set out to design a customer journey that involves losing blood and teeth but comments by CEO Oscar Munoz, that it will prove a “watershed moment”, acknowledge the need to be much more aware of the unintended consequences of how they operate. United’s most recent problem was exacerbated because they had too many people wanting to be on that flight. At the other end of the spectrum is a UK-based airline whose problems appear to arise when there are too few passengers. Bruce Temkin recently published a report into the best and worst customer experience companies in the UK. One of the brands towards the bottom of his list is a well-known regional airline. 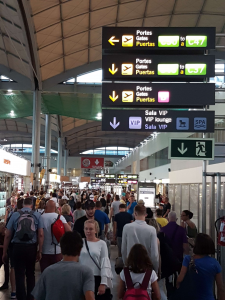 For years the word on the street (and I can vouch for the experience) is that they have a reputation for delaying or cancelling flights. At the gate, the message is that the aircraft has a technical problem but anecdotally passengers say it often coincides with less-than-full flights. Such is the regularity of schedule changes that many now choose an alternative route and carrier if they really, really need to get from city A to city B at the agreed time. It must be hard for loyal employees to take the criticism and yet the practice continues. Maybe it’s a cost-led strategy rather than customer-led, which is fine if that’s your choice of how to fly. Maybe. A few months ago I was presenting research findings back to a Board. It wasn’t all good news. “That was spectacularly uncomfortable to hear” – the words of a Chief Marketing Officer in response to learning what his customers really thought. Thinking I was about to be shown the door, his comment was followed by “Thank you for telling us, we needed to hear it”. That conversation stuck in my mind, serving as a warning bell about complacency; if we don’t understand our business from our customers’ perspective how do we know we’re anywhere near where we think we are? We do, absolutely, need to mind our own business. I love facilitating customer journey mapping workshops. Not least, because I always ask for people to share stories about great and awful experiences they’ve had. Sadly, when it comes to bad experiences it’s often the same brands who crop up time after time. One of those is energy company npower. I’m one of their customers and to be fair, I haven’t had a bad experience with them until now. I do, however, expect anyone in business to get the basics – such as my bills – right. But after my own first tangible experience, amplified by their reputation for customer service, I’m now heading for the switch button. 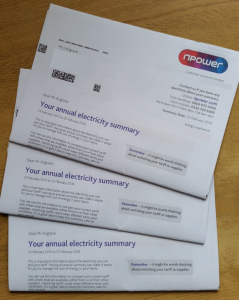 I’m a dual-fuel customer so I get two annual statements through the post – one electricity and one gas (I had asked for e-statements but that hasn’t been actioned, that’s another story). It’s a weighty envelope so I assume they’ve stuffed it full of newsletters, offers and new terms and conditions. Inside are indeed two annual statements but then each has an exact duplicate. Not only that but there is a third duplicate of each where the only difference on that version is that the amounts are all set to nil. So if anyone at npower is wondering why their costs are heading in the opposite and wrong direction to their customer satisfaction scores there’s a big clue, right there. How do you do that? In 2017 how do you get it so wrong? I’m assuming they don’t know as I’ve had nothing by way of apology or clarification. But then if they are not so customer-centric in the first place maybe I shouldn’t expect anything. In a meeting with a subscription services provider recently I was asking about how processes worked. For customers who turn up, buy and go again, everyone was all over it with metrics galore. But enter the world of the ‘What-if’ scenario and things rapidly became less clear. “If I’m this sort of customer, can I do this?”. “Do I need to do that first or do you do that for your customers automatically and if so, do they know that?” “What does this bit mean?”. And so on, all met with lots of “Umm…” and “I think…”. I make no apology for mentioning again an example of one of the most head-the-sand cases I’ve come across. A utility company I did some work for had, according to its leadership team, very high employee engagement. It followed that while they believed their processes could be better the problem wasn’t their people. On investigation, it transpired the people were totally and utterly disengaged. They didn’t care about fixing customers’ problems and did just enough to get by. They were intelligent people but were fighting a lost cause. If they met someone in a pub who asked where they work, they were more likely to say they were unemployed or make something up than admit to working at the brand. They’d told management time and time again what was going wrong but nothing had been done. And the reason why the employee engagement score was so high was because they deliberately ticked the 10/10 box, thinking that if they didn’t say they were fully engaged they wouldn’t get a bonus. The leadership team had no idea of the extent of the true levels of engagement. And that’s the point. When we take an operationally-led view we know where we think we’re at because we’ve built the processes, plugged in our systems and measured what we think is right. But look at the same processes from a customer’s perspective and we have a very different view of our world. If we don’t know our own business, we can’t be confident about understanding how we are making our customers feel. They determine what a customer will do next and how they’ll talk about us to others. It has a real commercial impact and so we need to understand both the experience and the consequence. 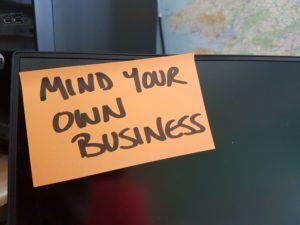 We should, literally, mind our own business before our customers are the ones who bump us off. As consumers we know that a company is only as good as the last experience we had with them. But it does seem that some companies assume if they are able to give a good experience once, they are doing it every time, everywhere. It’s obviously a very dangerous assumption. I’m often asked who we should look to for customer experience inspiration. Who gets it right and what do they do? We all have our favourite brands and stories to go with them. There is no shortage of companies to learn from. They have the right mindset and are doing great things. But, organisations not only need to be proficient at walking before they can run, they can’t afford to forget how to walk once they can run. And so before trying to emulate the great and the good, a question that many businesses should ask is “What do we do today that we should stop doing?”. What is causing customers and employees, including (especially) the ones who don’t complain, frustration, angst or simply to not engage? Business leaders may say they are profitable, they have many satisfied customers and their people are proud. Yet the laws of unintended consequences, of cross-functional operations working to different agendas and of short-term profit-taking throw a protective veil over complacency and corrosive experiences. The issues are laid bare these days for all to see, especially on social media and review sites. Take, for example, Trustpilot. I’m increasingly seeing businesses using the rating as a customer metric in addition to Net Promoter Score, customer satisfaction, effort scores and so on. It’s freely available and constantly updated. Companies can track their score, benchmark against competitors and compare parallel sectors. Crucially though, the unsolicited comments contain a rich seam of qualitative insight that tells us exactly why things go well or not. Why would you not want to tap into that? Or, at least learn what makes competitors’ customers unhappy to make sure it’s not happening closer to home? John Lewis is one of the UK’s favourite places to shop. It keeps winning awards for its in-store service. The employees have a real stake in making sure customers are happy and it shows. However, go online and the story is very different. Where their stores and people will be rated 9s and 10s out of 10, the website scores just 1.4. That’s as rated by more than 2300 recent reviews. There’s a lot of good stuff that happens at John Lewis but right now, online they are keeping company with SouthernRail (0.9/10) and lag behind even Ryanair (2.2/10). Broken promises, conflicting information, inflexibility and being difficult to communicate with are just some of the reasons cited. Whether that’s a consequence of outsourcing or handing over the post-sale experience to suppliers, only John Lewis themselves fully understand. 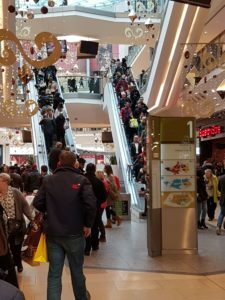 However, there are many comments that illustrate the commercial consequences, as one unhappy customer said: “Have spent thousands at John Lewis over the years but after this will go elsewhere”. Employees answer the negative comments with a resigned “Sorry, we really didn’t mean this to happen” tone. And one customer summed the gap between expectations and reality by saying “Because it’s John Lewis, it feels worse”. Another brand struggling to keep up with the expectations it has spent much time, money and effort creating is firstdirect. For many years they were always at the top of the list of exemplars. Personalised and friendly service, easy to get hold of and no need to repeat issues were just some of its credentials that set it apart from other banks. At a time when the one thing retail banks need is differentiation, they seemed to have it in spades. Now though, firstdirect scores just 1.9 out of 10 with many unhappy customers venting their frustrations about things being slow, disinterested employees and not keeping promises to call back or follow-up. Meanwhile, the airline that claimed to be “the world’s favourite” is also no stranger to having a mixed bag of reviews. On Trustpilot at the moment British Airways’ score is just 2 out of 10. Reviewers talk of getting “better treatment with Ryanair”, of misinformation and of empty apologies. At the same time though, happy customers rave about the friendliness of staff, easy booking processes and clean aircraft. On the aviation-specific review site Skytrax, BA sees a similar spectrum of views from “Cannot fault the airline” to “Terrible service”. Finally, but no surprise this time, is BT. Every time I run a customer experience workshop I ask people to share a couple of stories of good and bad experiences they’ve had. There are brands who feature regularly in both camps but BT is by far the most frequently cited company for bad experiences. 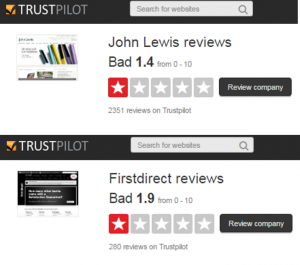 On Trustpilot, they score just 0.3 out of 10 from the last 1700 reviews. Worryingly, if you were leading BT, many comments talk about the highly negative emotional impact – “I’m being driven to despair, I’m distraught and powerless” is just one recent example but reflected by many others too. The recurring themes here are an inability to find someone to take ownership of a problem, staff attitude and promises that aren’t kept, again and again. That really isn’t what you want people to be sharing about your brand. It’s proof the brand is purely what people tell each other it is, regardless of what the strapline says it should be. And so BT’s internal rhetoric, it would appear, has some way to go. They talk openly about their approach being to “put customers first”, about wanting to create “the most customer-focused company in the world” and having an ambition by 2020 to “deliver great customer experiences”. Easy to say, much much harder to do. And in a way, that’s the point. Whether you have made a public declaration to be the best customer experience company or you are simply about making profit, it doesn’t matter to us as customers – the very least we expect from any business is that we can trust them to do what they promise, they’ll make it easy and we won’t have any reservations about doing it again. Surely, the basics are not too much to ask? As with most review sites views tend to be polarised. So at the other end of the spectrum, regularly attracting fans and scores of 9s and 10s are the likes of Moo.com, Mr Memory, Outdoorkit and Dial-a-Flight. These are not corporate giants but by and large they consistently get the basics right , the things those at the bottom of the pile can’t seem to manage. Common themes cited by customers are that they all have friendly and knowledgable employees, they do what they say they will and they keep customers informed. They make it feel like they’re on the customer’s side, they are perceived as good value and are easy to do business with. It’s no more complicated than that but the consequences for the bottom line are summed up neatly by one Outdoorkit customer who says “I seem to shop here more and more lately”. Are you creating despair or fans? Or both? I’ve looked at the ends of the scale to make the point. But is there anything to learn from those in the middle? I’d say lots. In terms of rising expectations, today’s scores of 8 will be tomorrow’s 7 and next week’s 6 so beware of complacency. Average mid-range scores also show these companies can and do get it right sometimes – they’ve done the hard bit but just lack the consistency. They have the ability, they just need to make the good things happen regularly rather than sporadically. Having the aspiration to give great experiences is one thing but the people who lead and manage in organisations must also be sure they have a total self-awareness about what it’s really like to do business for anyone at anytime and anyhow. By all means protect and improve the good experiences but their presence doesn’t automatically mean an absence of more damaging experiences. https://empathyce.com/wp-content/uploads/2014/08/logo.gif 0 0 Jerry https://empathyce.com/wp-content/uploads/2014/08/logo.gif Jerry2016-08-01 17:15:312016-08-01 17:21:11Do the good customer experiences obscure the bad ones for management? In the world we live in it seems to be very easy to over-complicate things; to make a cottage industry out of lots of stuff. Inside a large corporate recently I saw a project managed by several highly-paid people whose goal was to document all the organisation’s other projects. Ian Golding wrote an emotional blog last month about why Ritz Carlton has the reputation and repeat business it does. Yes, Ritz Carlton is at the premium end of hotel accommodation but the core of the experiences they offer is not expensive; it’s a mind-set and an attitude that’s as easily and as effectively adopted by a hotel chain as a telecoms business, utility or a local café. The point is that not only does it cost very little, the flip-side is that leaving such basics untendered can cost huge amounts in revenue, profit and customer loyalty. Putting a poster on the wall, a powerpoint slide or a statement on the website proclaiming that “We put customers at the heart of everything we do” is easy. It’s not easy to do but it’s not impossible either. At the risk of being accused of being a grumpy old man take, for example, common courtesies. A “Thank you” here and a “Please” there. Are they a consistent part of our customer experiences? They often won’t feature in any journey mapping exercise because they are so basic. Of course that happens all the time, doesn’t it? I know it’s not the case for two very well-known food retailers. 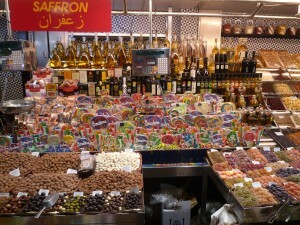 One sets out its stall to “give excellent customer service with an emotional benefit that feels good and feels right”. The other has “a renewed focus on the consumer …to achieve success”. The reality though is somewhat different. I live in an urban area where I’m lucky to have had these two chains within walking distance for many years. Despite the high turnover of staff in that time, by and large the people have always been polite. In both stores though, things have changed and increasingly the people there are rude and contemptuous. They are not offensive, but there is the impression of complete disinterest. Where once we would get “That’s £5.10 please” followed by “Thank you” as they hand me my change, I now hand over my goods and get an impatient look back. Apparently, I’m magically supposed to know exactly how much I owe them without them telling me or moving the lottery cards stand out of the way so I can see the display on the till. Having had to ask what I owe, the change is unceremoniously dumped into my hand with no comment, let alone it being counted out with a “Thank-you”. Instead, I find myself saying thank-you to them, then cursing myself as I leave, knowing it should be them thanking me for paying their wages. If it happened once I could dismiss it as someone having a bad day. We all do and there are more important things in life to worry about. However, to happen each time creates a real feeling of being treated with a lack of respect. Contempt is a corrosive thing in any relationship. If either side senses it exists, the going of separate ways becomes an inevitability. As it happens, one of the big-four opened one of its local supermarket stores recently. It wasn’t needed and the arrival of one of the major players met lots of opposition. However, the local incumbents didn’t deserve the loyalty they thought they were entitled to and as a result I and many others choose the more corporate option. Local people work in there too and they are every bit as polite and as professional as you want them to be. They say hello, smile and help make things quick and easy. Why would I choose an unpleasant experience over a friendly one? 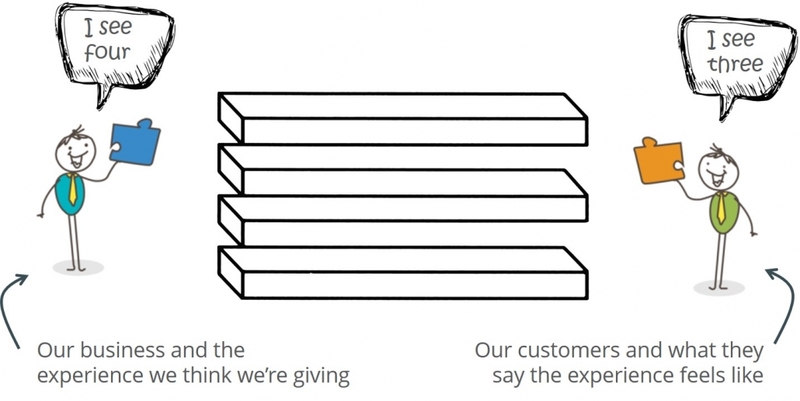 So when it comes to designing customer experiences there are a couple of lessons here. One, are we overlooking the things that are really important? It doesn’t have to be complicated. The second is that when a sceptical Operations, Sales or Finance Director asks how much it will cost to have better customer experiences there are a hundred such stories that show the cost of keeping customers can be pretty much zero yet the real cost of not having those basics in place is huge. Unfortunately for the bottom line, complacent employees will out-last customers who would be loyal but who also have a choice. The not-so secret to the right customer experience is attitude – especially at the organisational level. https://empathyce.com/wp-content/uploads/2014/08/logo.gif 0 0 Jerry https://empathyce.com/wp-content/uploads/2014/08/logo.gif Jerry2016-06-02 16:41:402016-06-02 18:31:12Who hangs around longer: complacent employees or valuable customers? Depending on the way you look at it, complacency is either the arch-enemy of customer experience or the reason it exists. I’ve seen many a sceptical director shrug and say “Why bother? We’re making money so we must be doing it right”. Yet while the heart of customer experience might be more a way of thinking than functional, the warning signs of where it’s going wrong can be very obvious and very tangible. Take John Lewis. Over the years it’s been one of our most celebrated brands, synonymous with straightforward, easy and helpful customer experiences. And the partnership has seen the benefits in its commercial performance as a result. So here’s a question: out of 10, where 0 is rubbish and 10 is brilliant, what would you say JohnLewis.com scores on Trustpilot at the moment? I know there have been a few issues of late but I’d have said 7s and 8s at worst. Time to think again. Based on over 2,000 customer reviews the average score as of this week is ….. 1.4 out of 10. How and why did that happen? Only those inside John Lewis know the answers but one suggestion is the outsourcing of its customer experiences. Handing over your brand to a third party is no excuse, only a reason. Outsourcing may promise hand-offs that are invisible to customers and a lower per-transaction cost. However, without the controls to ensure consistency of the intended experiences the number of unnecessary contacts increase, the costs go up and customers’ loyalty goes down. Years of goodwill being unravelled for all to see. As with any customer measurement system, there are caveats and foibles. But I wonder how many organisations would act differently if public metrics such as the Trustpilot score or Tripadvisor rating were more visible internally and part of the voice-of-the-customer mix. Ironically, over in the energy sector, npower maybe further along the organisational self-awareness curve. It’s often in the news for the wrong reasons; scrapping its dividend payment, being fined £26m by Ofgem for failing to treat customers fairly and being told if things don’t improve they will be barred from selling their services. And on the back of its results this week came the announcement that there will be a significant human cost with 20% of its workforce to be laid off. With that news though came a plan, a two-year recovery programme. So for npower, at least the reasons for its difficulties are known and it is trying to do something about them. Lower wholesale energy prices, government obligations and a quicker than expected shift to renewables are to blame in part. However, it is the self-inflicted broken processes and billing infrastructure that are driving many customers away. I’m a customer of npower and of John Lewis. For the people who work there and for my own sanity I really want them to come right. Npower has plans but the signs are that things have a way to go. For example, I recently received three identical envelopes in the same post. Inside, three identical annual statements with identical supporting information notes – tripling the cost at a stroke and leaving me playing the spot-the difference, wondering if I’ve missed something subtle but vitally important. Do they know that’s happening? If not, why not? But if they do know, wouldn’t a quick letter or email to explain that I don’t have to worry about missing something help? It’s about knowing what the experience is like today and how it feels compared with what it should be like and having the appetite to do something about it. Making things worse, the main call-to-action appears to be to switch suppliers so exactly what the statements mean and what I’m supposed to do next will have to be the subject of a call to their helplines… I hope the recovery plan will be using lower customer effort as a measurement of success. In contrast, the organisational self-awareness that Ryanair had prompted it to launch the ‘Always Getting Better’ programme. 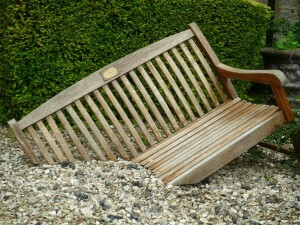 The about-turn in being customer focused is bearing fruit in its forward bookings, load factors and customer feedback. Meantime, motoring giant Ford meantime is also setting about the way it does things. Speaking earlier this year, Ford’s President and CEO Mark Fields talked openly about changing the culture to be more empathetic to its customers. The mindset was no longer one of being a manufacturer or even a technology company but an innovative, user-experience company. Ford employees are encouraged to challenge the status quo, to question tradition and to not take anything for granted. They won’t get penalised in their performance reviews for trying something new; the view is that succeed or fail, you learn. And on digitalisation and data, Ford aims to identify the right experiences first then seeks the technology to deliver it. Not, trip over itself to install latest IT systems just because it’s the latest IT system. Very familiar brand names with varying degrees of organisational self-awareness. It’s what shapes their customer experiences and as a direct consequence they will see very different results. Thank you for reading the blog, I hope you found it interesting and thought-provoking. I’d love to hear what you think about the subject so please feel free to add your comments below. A customer-centric culture doesn’t happen simply because it’s on a presentation slide as a strategic pillar. It’s a topic that risks being swamped by platitudes and theory so I was curious to hear Mark Fields, President and CEO of Ford Motor Company, talk about what the transformation to a customer experience culture looks like in reality. The size of the organisation is irrelevant but I wanted to share some of his thoughts from a recent FastCompany interview . There are a number of characteristics that we can all identify with, learn from or at least be reassured that we’re heading in the right direction. Firstly, Mr Fields emphasises the need to be very clear about who you are. In Ford’s case they have been a manufacturing company. With connectivity and the internet-of-things creating huge possibilities they are now moving through being a technology business to a user-experience and mobility company. Transformation can be a scary word for many employees. Ford’s approach therefore is to be clear that it’s not about moving from an old business to a new business, they are moving to a bigger and better business. And that will need to include winning over everyone in the supply chain and the franchised sales and service teams too. Wherever they work, colleagues are encouraged to challenge custom, to question tradition and to not take anything for granted. Having worked for large corporates who frowned upon seeking and sharing learnings from outside the sector, that alone is refreshing to hear. Ford reassures its people they wont get penalised for trying things, knowing that some will fail and some will succeed. It might be in product design, customer engagement or stakeholder management. It might be in new methods of customer feedback or in innovative ways to bring to life what it’s really like to be a customer. But, so the approach goes, you learn whether you win or lose. Virgin Atlantic has a similar philosophy. Google Glass had certain benefits but the airline wanted to see how else it could make the lives of its employees better. With wearable technology, they knew it would take some time for a critical mass of customers to use it but they found real advantages for their operations team. As a result Virgin’s dispatchers now use smart watches to improve the turn-around efficiencies of aircraft. On technology, with all the data, sensors and processing power we now have, Mark Fields is clear. He wants Ford to be known for being an automotive and mobility company but is very aware of the risk of falling into the trap of technology for technology sake. His answer is to think about the experiences first then find the best technology to deliver them. It’s the same principle with customer measurement; get the experience right first and the metrics will look after themselves. It means that at Ford, there is a new and relentless focus on empathy. They are using ethnography to better understand their customer personas, their interactions and how the products and services are used. It gives greater certainty that the changes being made are the right ones. Cultural change is never quick. After all, it’s a state of mind and isn’t something that can be project managed. The right changes will not happen if the organisation is not open to the very idea of customer-centricity. So to have the boss eulogising about the focus on customer experiences suggests the chances of longevity are good. That said, Ford will be very aware that changing a culture takes years. Back in 1909, customer-centricity had a different meaning. To improve productivity and make the car affordable to the masses, the company’s founder Henry Ford restricted customers’ colour choice to black. Those with memories of more recent times may recall Ford’s 1990s advertising campaign in which Brian May’s rousing soundtrack promised “Everything we do is driven by you”. 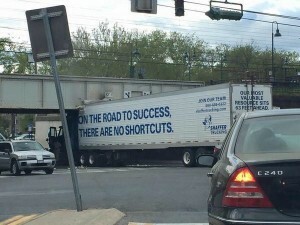 Albeit a strapline with an inward-looking perspective, it was well-intended. So while first challenge is to have the right mindset, it doesn’t stop there. 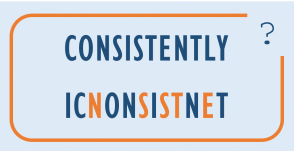 The key is then to keep up the momentum, to make sure everyone understands what that frame of reference is, why it’s important and what it means for them on a day-to-day basis. 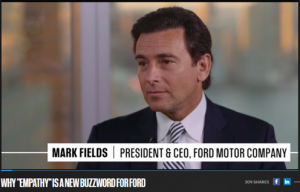 Ford is not alone in having such a philosophy and Mark Fields isn’t the first CEO to say they are customer-centric. Time will tell. To succeed, I believe an organisation must combine a deep understanding of its customers with highly motivated employees. But most important of all is that the business must also nurture a culture where those insights and enthusiasm are allowed the opportunity to prosper. At best, it will drive a business forward as it adapts to the changing world. At worst, it will stop it being from standing still and being overtaken.